The nectarine is a rounded fruit with a single central groove. Its smooth skin is blushed with hues of ruby, pink and gold throughout. The flesh is perfumed with aromatics, overtly juicy when ripe, and golden colored with red bleeds at the skin and surrounding the central rough pit. A ripe nectarine's texture is soft with a melting quality, its flavors balanced with layers both bright and sweet. Nectarines are available year-round with a peak season during late spring and summer. Nectarines are the result of a natural occurring genetic mutation of the peach. 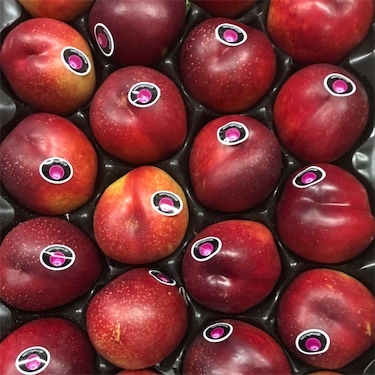 Nectarines, botanical name, Prunus persica nucipersica, are a stone fruit and species within the genus, Prunus, alongside cherries, apricots, plums and almonds. 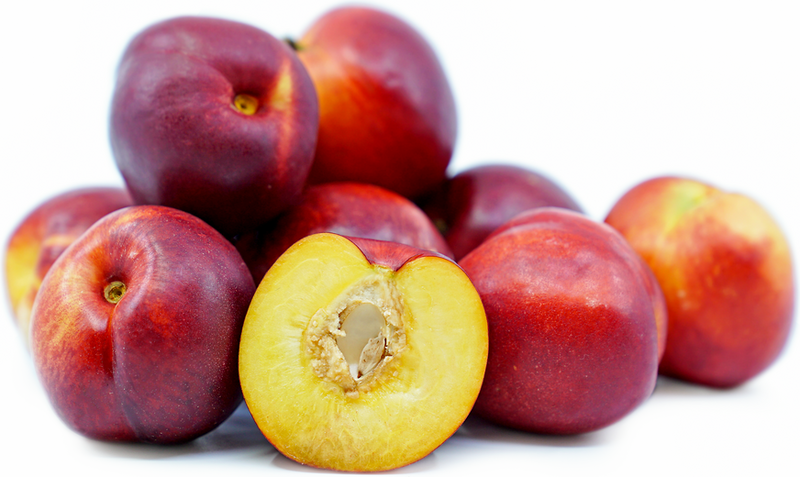 There are two types of nectarines: yellow-fleshed and white fleshed. White-fleshed nectarines are typically low or sub-acid while yellow-fleshed nectarines are both sweet and tart. A nectarine seed is considered highly inedible as it can contain high levels of poisonous hydrogen cyanide. This toxin is readily detected by its bitter taste. 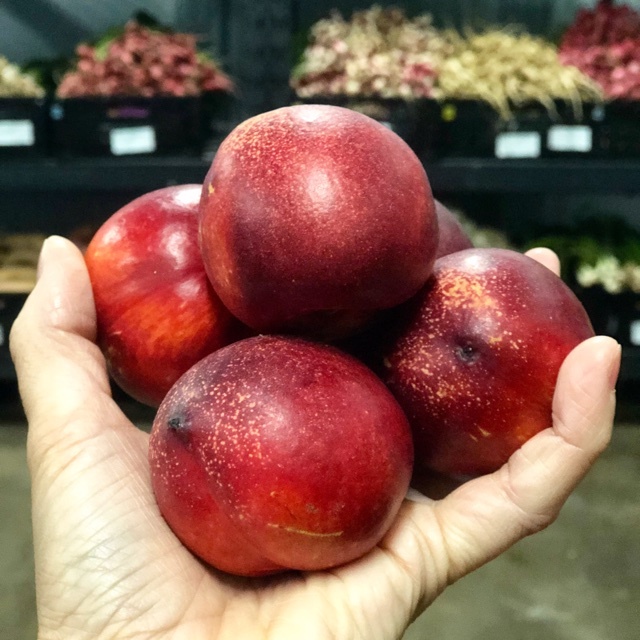 The fruit of nectarine has high levels of beta carotene, calcium and vitamin C. Herbalists use the branches and leaves of nectarine trees as a demulcent, for stomach disorders and as a kidney and intestine detoxant. Nectarines are suitable to be used in any recipe calling for peaches. They are best for eating fresh out of hand, yet they can also be poached, grilled, made into a compote, syrup, jelly and infused into drinks or added to dessert recipes such as cakes, pies and ice cream. Nectarines pair well with other stone fruit such as apricots, cherries and almonds, citrus, berries, vanilla, cinnamon, cloves, cream and custards. Savory pairings include herbs such as basil, cilantro and arugula, hazelnut and pistachio nuts and oil, aged cheeses such as parmesan and mild cheeses such as ricotta and burrata, sausages, pork belly and grilled fish. The flowers of nectarine trees can be steeped and used to impart flavors in teas. The definitive origin of nectarines is unknown. Documentation of the first nectarine was recorded in English in 1616. 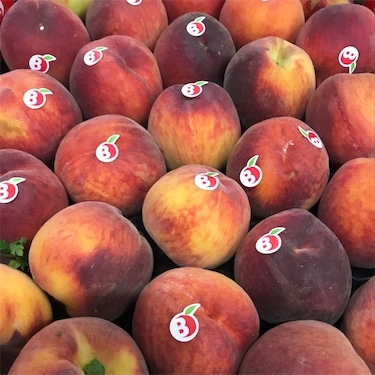 As peaches are native to central Asia, though, there is geographical speculation that the first nectarine was found growing on a peach tree within the same region and trade routes brought it to Europe in the 15th century. Genetic studies have concluded that nectarines are created due to a recessive allele. Without two copies of a gene, specific genetic traits will not be inherited. Thus, the nectarine naturally evolved as a fuzz-free peach. The lack of fuzz contributes to the fruit's brighter colorings and to its ability to bruise more easily. Nectarines still occur as bud mutations on peach trees. The trees' preferred climate is similar to that of the peach. Their growing regions are regulated by the seasons. Only in spring and summer will fruit become ripe. Nectarine trees need rainy winters and hot dry summers.  Cultivation occurs in both the Northern and Southern hemispheres which experience opposite summers and winters allowing for year round availability. Recipes that include Nectarines. One is easiest, three is harder. 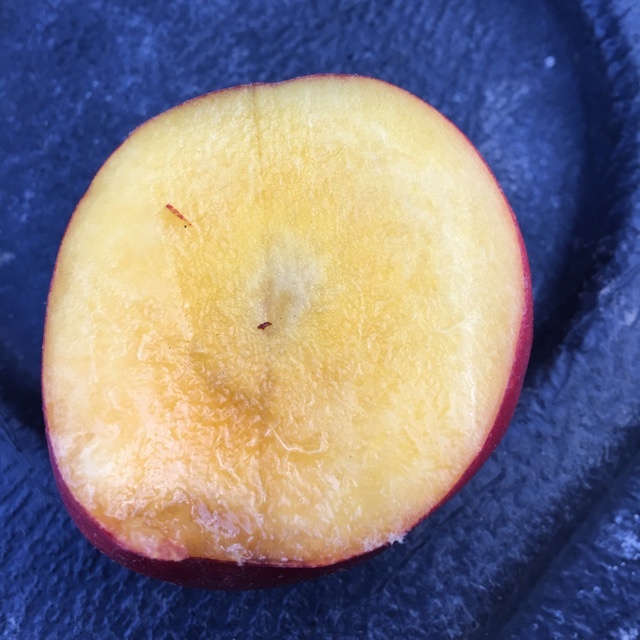 People have shared Nectarines using the Specialty Produce app for iPhone and Android. 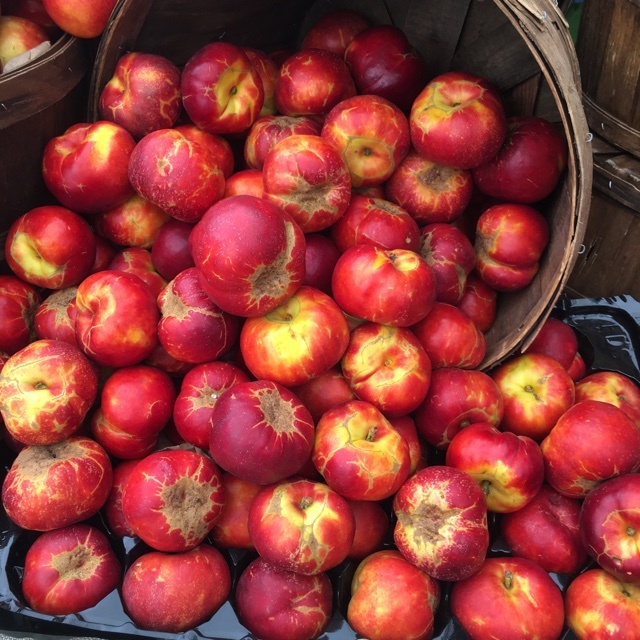 Sharer's comments : Nectarines spotted at Little Italy Mercato. 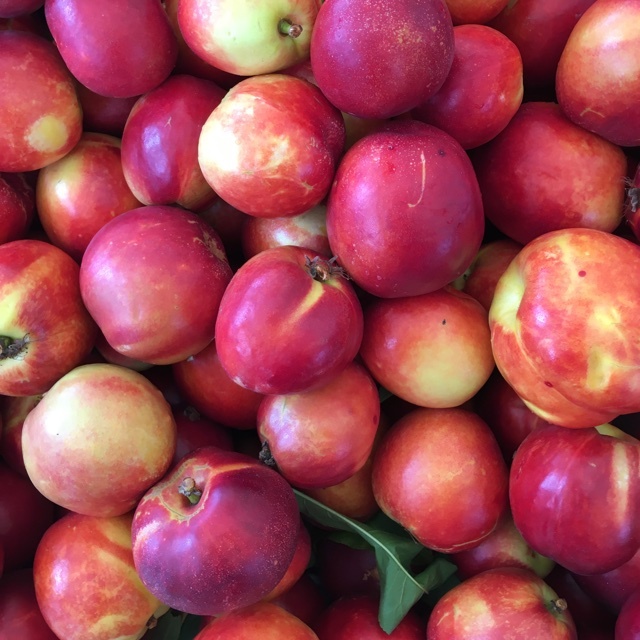 Sharer's comments : Nectarines spotted at Culver City Farmers Market. Small and tart. 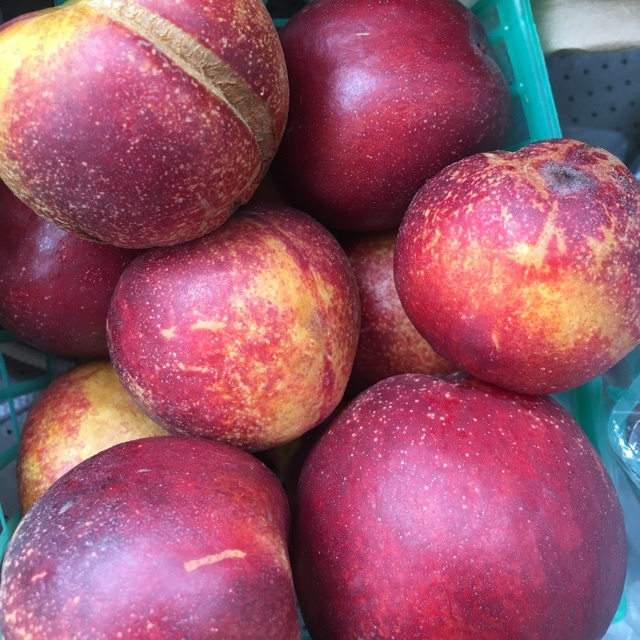 Sharer's comments : Nectarines spotted at Virginia Park Farmer's Market. 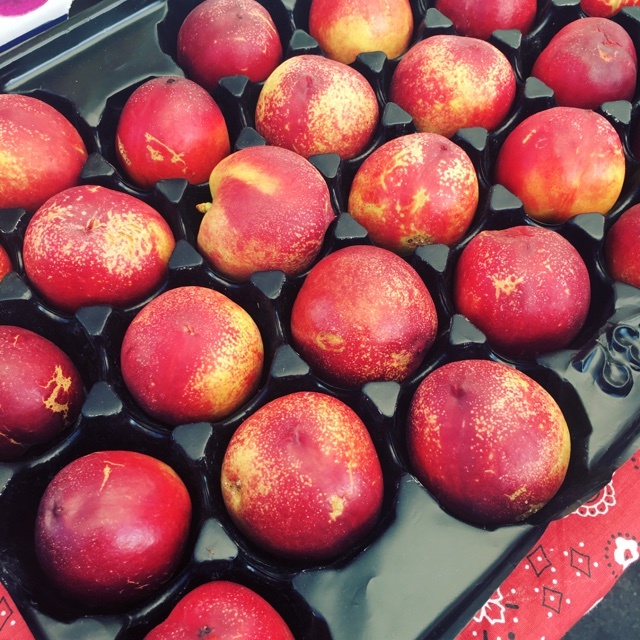 Sharer's comments : Nectarines spotted at Torrance Farmer's Market. High acid but balanced in flavor. 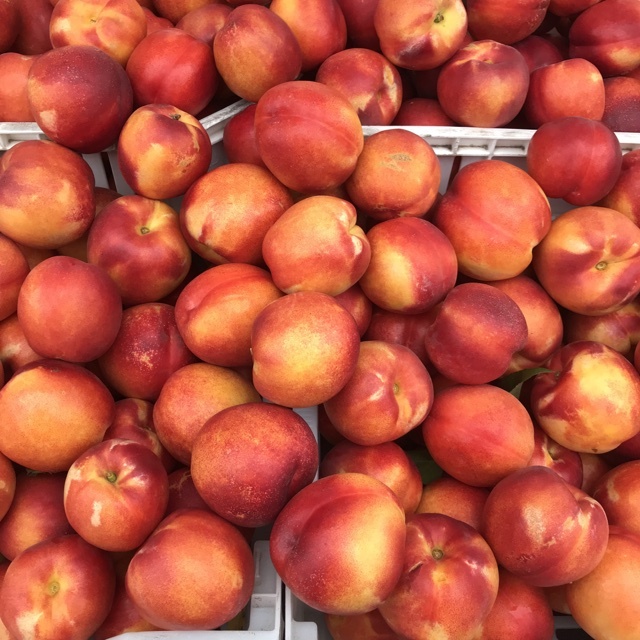 Sharer's comments : Nectarines spotted at Specialty Produce. First of the season yellow nectarines from Murray Family Farms. Make sure to grab ones with a lot of sunspots on them for the highest level of sweetness! 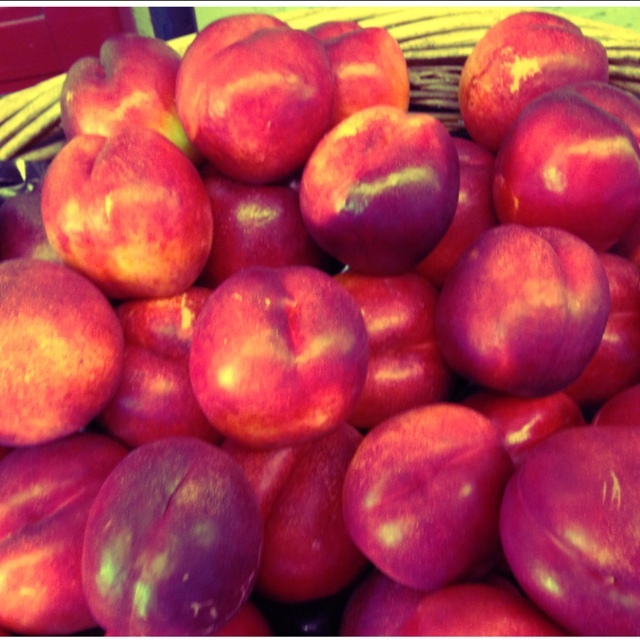 Sharer's comments : Nectarines spotted at Pike Place Market. Organic Western Sweet Nectarines ready to devour for $2.99 lb! Sharer's comments : Nectarines spotted at schnucks. Sharer's comments : Nectarines spotted at Chino's Vegetable Shop. 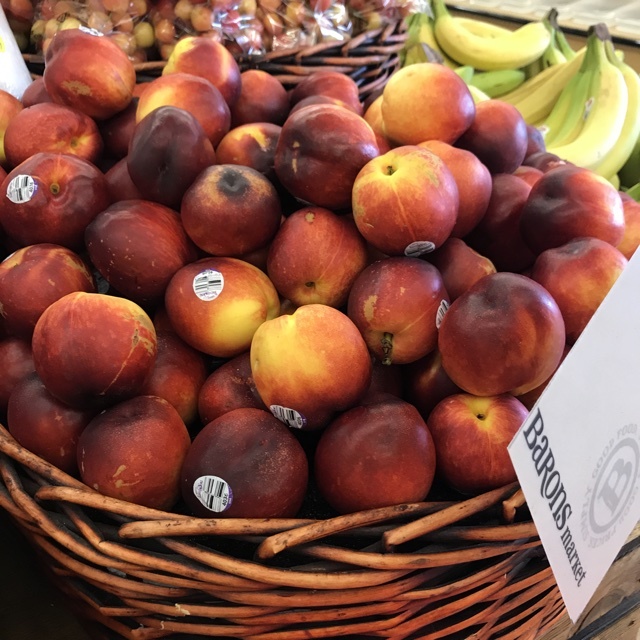 Sharer's comments : Nectarines spotted at Barons Marketplace. Sharer's comments : this nectarines are so good!! 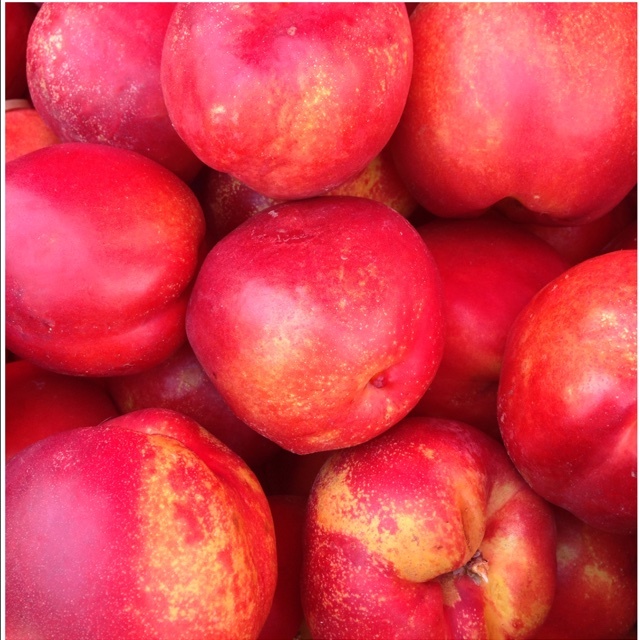 Sharer's comments : Nectarines spotted at Santa Monica Farmers Market.